This cold salad will heat you up with spicy goodness! I've said it before and I'll say it again: I'm an Asian food fanatic. Thai food is the way to my heart, and anything that's both sweet and spicy is right up there on my list. Thai Papaya salad (or Som tam) is perfect for winter if you're sick of all those heavy comfort foods, but you still want some heat. It's a cold salad with a spicy kick! Papaya is also in season, so check your local farmers markets for the best fresh produce, and get cooking! 1-2 fresh chillies – add more if you're game! Roughly crush a handful of roasted peanuts with mortar and pestle. Clean mortar and pestle after. Melt sugar in a small pan with 2 tablespoons of water, it should resemble a shiny thick syrup. Peel the papaya and shred into thin strips. Soak them in cold water and set aside. This makes the papaya crunchier. Cut green beans into one-inch pieces. Take the chillies and peeled garlic and gently grind in mortar and pestle. Do this roughly, you don't want a puree. Add crushed peanuts and mix well. Add the papaya and mash gently so that it soaks up the flavours. Add the liquid sugar, tomatoes, beans, lime juice and fish sauce and mix. Serve with peanuts sprinkled on top. In Thailand this dish is usually served with sticky rice, but I think it goes fine without it! 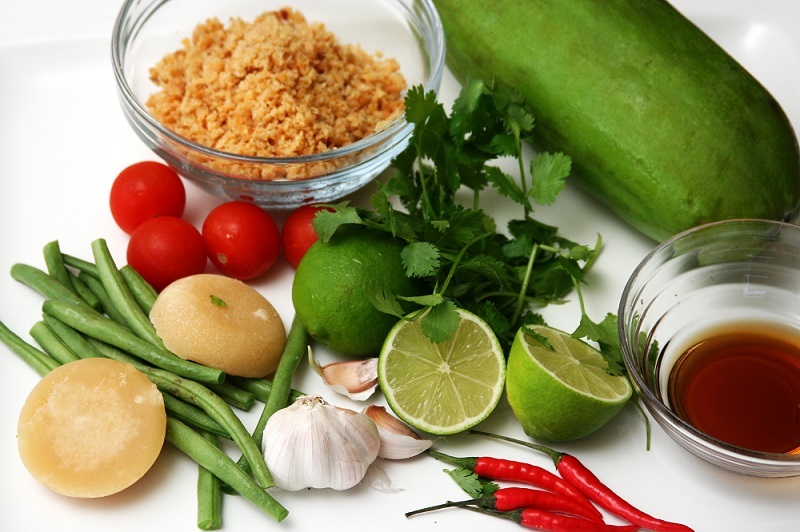 Som Tam is so simple, and there is hardly any washing up to be done after. It's healthy, fresh, and papaya is available throughout the year. Buy fresh organic papaya from your local farmers market! When you buy fruit and veg do the following: choose locally produced, in-season and fresh rather than frozen, don't use plastic bags and avoid any overpackaged items. Do this for a month then try to keep going.